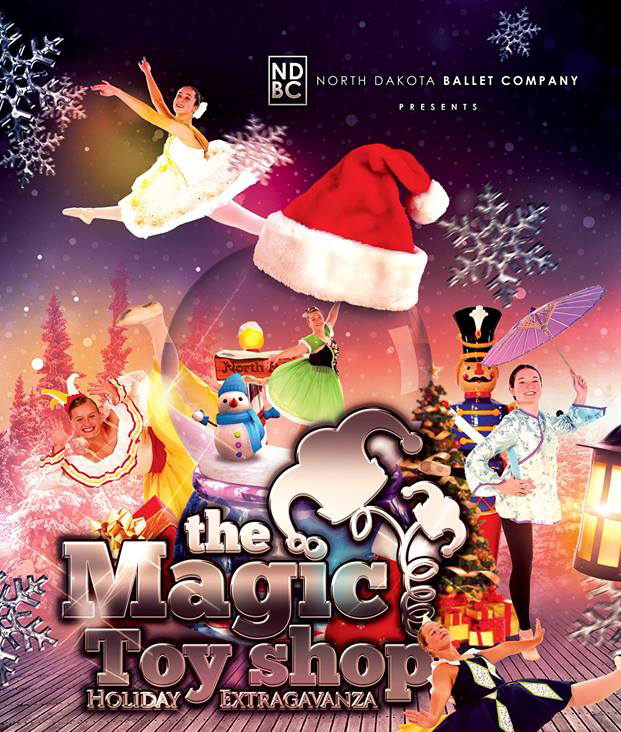 The ND Ballet Company & Academy will bring on the holiday spirit in a fun-filled dance production and holiday music with The Magic Toy Shop Ballet – Holiday Extravaganza. In this holiday dance production celebrates the magic of the season with Act featuring “Christmas in NYC” with fun-filled holiday revue with some of your season favorites with tap, ballet, and jazz dance. Act 2 is a one act ballet. The Magic Toy Shop is where magic happens in the toy shop as the little boy sneaks in and finds the dolls coming to life. When: Dec. 14 at 7 p.m. and Dec. 15 at 2 p.m.
Tickets: $12 children, $15 adults. Purchase tickets weekdays at 701-746-5500 or anytime at www.empireartscenter.com. The production team for this ballet includes: Laura Arneson, Lauren Paulson, Leigha Wallin and Elizabeth Gilbert. This production features local dancers from the ND Ballet Academy and the pre-professional division. The Magic Toy Shop is supported in part by the Myra Foundation and the ND Council on the Arts. This program is supported in part by a grant from the City of Grand Forks through the Community Foundation of Grand Forks, East Grand Forks & Region. As a 501(c)(3) nonprofit organization, the ND Ballet Company (NDBC) was established in 1962 and is the official state ballet of North Dakota committed to quality dance instruction and performance opportunities for all ages. NDBC offers dance instruction for all ages as well as intensive ballet training opportunities in our youth ballet company and pre-professional division for adults. In addition we offer community based classes for adults and a high quality competitive dance training program.